Fly directly to Leticia, Colombia’s southernmost city, and you’ve reached your gateway to Amazonia. Vast, wild and potentially the most important ecological system on earth, no trip to Colombia would be complete without a foray into this dense virgin jungle. You’ve seen pictures and you’re aware of its importance to the wellbeing of mankind, but nothing will prepare you for the sheer beauty and majesty of this natural wonder. Covering around seven million square kilometers (roughly 25 times the size of Britain), the Amazon is almost too large to comprehend. Home to a diverse array of animal species as well as a never ending list of flora and fauna, some of which has yet to be discovered; this jungle is an adventurer’s dream. One of the last places on earth that still holds many secrets and provides sanctuary to untouched tribes and cultures, there’s no doubt that you’ll leave here feeling humbled and motivated to protect that which you’ve been lucky enough to experience first-hand. 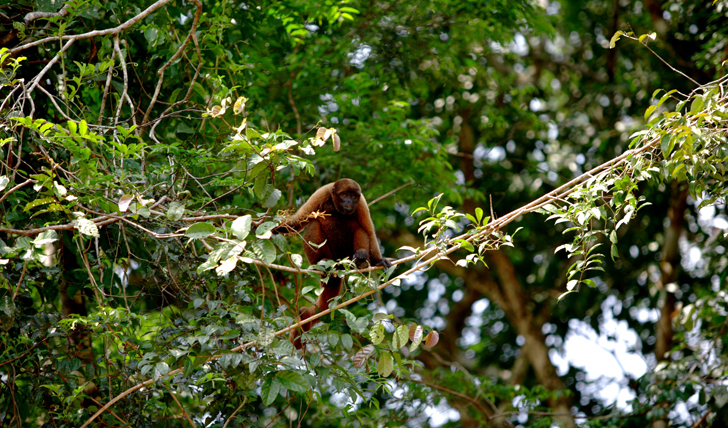 The part of the Amazon accessible from Colombia is often referred to as Amazonia. Covering almost a third of the country, it is an area providing extensive opportunities for wildlife viewing, jungle trekking and much, much more. We’d recommend you jump in a boat with one of our guides and sail down the Amazon River in search of the elegant river dolphin, caimans and monkeys. A trip to an indigenous village is always an eye opening experience and Mocagua Village, just a short boat ride away from Leticia, offers authentic and immersive experiences to all of its visitors. Spend a few days here hanging out with the locals, fishing, eating and learning as much as you can about their culture. Back in the thick of things (quite literally), head out into the dense jungle on a trekking tour and learn all about the different species of flora and fauna that thrive here. The noise of the jungle will provide a mesmerising sound track to your adventure as you move deeper and deeper into the heart of Amazonia. Despite the detrimental effect mankind has had on the Amazon over the years, Amazonia still feels like a wild, rugged, impenetrable force to be reckoned with, and that’s just how we want it to stay. Walking amongst the trees, we were all too aware of the jungles important role in the preservation of our planet and being able to see it up close is an awe-inspiring experience. Exotic creatures, colorful flora and ancient cultures: a perfect recipe for the trip of a lifetime.